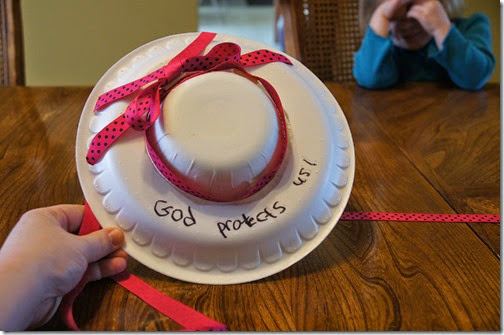 All you need to make this super cute hat craft for kids is a paper or foam plate and a paper bowl. Using your bowl as a guide draw a line around the hat on the bottom of the plate. Carefully cut out the circle just a little smaller than your circle and press the bowl into the hole. 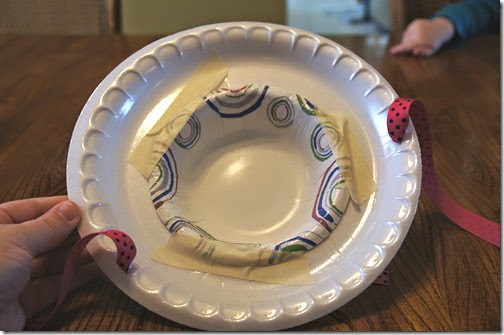 Affix the bowl to the hat with tape or masking tape. Now you can add ribbon around the bowl and down the sides to decorate your hat. Prophet to Nineveh, write the words “God protects us!” on the top. 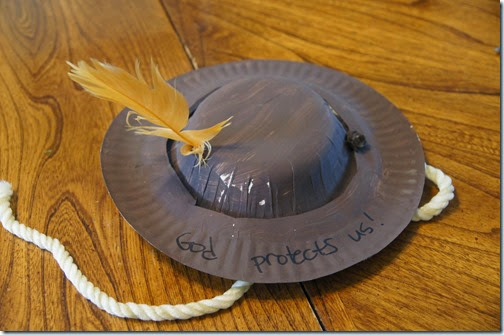 This will remind the Preschool-3rd graders that just like a hat protects us from the sun, wind, and rain, God protects his us too. The boys made their hats look a little more like a cowboy hat by painting them brown and then sticking a feather in the top. The tie was from rope instead of ribbon. Again, this would be a fun preschool activity for H is for Hat or alongside a Caps for Sale Five in a Row Unit too.